Been meaning to read this for years and years. I could hardly claim to be a book lover from England having not read it could I!? My first impression was that this was a 2-D version of George Eliot and after beating a path through Middlemarch last March, I was kind of grateful it was an easy saunter. It’s a breakneck pace as well. Austen seemed in a hurry to finish this with each chapter a few pages long. It’s as if she set herself to write a few pages as a chapter a day for a couple of months or something knowing that there’d be a book at the end of it. 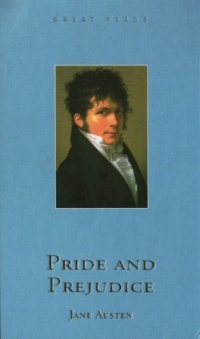 This is my first Austen novel and, despite being more than familiar with the story, as the wife wears out the P&P BBC DVDs that I brought her a few years back, I was really curious to be reading it for myself. The characterisation is great. Each character stands well on their own and yet complements the entire cast of the book. There’s someone for everyone. The wit and wisdom Lizzie and her father share I really appreciated. And the confrontation between Lizzie and Lady Catherine was superb. The way that Austen uses each of her dialogues to carefully form the mindset of Lizzie throughout the book is beautifully done too. Personally, I think the BBC finished what Austen had begun! Nothing is more deceitful… than the appearance of humility. It is often only carelessness of opinion, and sometimes an indirect boast. If you’ve got Google Earth installed on your pc, you can actually see the locations mentioned in this book by downloading Arukiyomi’s Google Earth – Pride & Prejudice file. I’m working my way through this right now on DailyLit. It is one of my wife’s favorite novels and she also loves the movies. I thought I’d read it to see what the fuss is about. I would agree that the pace moves pretty quickly, I also think it’s interesting how it’s almost entirely dialog driven, which leads to sparse descriptions of the surroundings as you mention. It’s quite similar to reading a play. I really love this book and probably read it 4 times just in high school. It’s been years, though, and I should give it another read. I read it YEARS ago, but my book club just chose it for our July read. I try and read it every year. I am such a sucker for Ms. Austen. My favorite character in this novel was the mother; she was depicted so perfectly as the type of mother who lives in martyrdom. Not to mention superficiality. I’m sorry you feel the way you do. Perhaps you missed this: I do acknowledge the parts of the map that are yours in the folder properties at the top of that layer. I even link to you so people can get to your full map. I have not “borrowed” it at all. I took it as it was. I then acknowledged your original file and edited the part I took. I’d like to think that you and I are equal contributors to the enjoyment of literature and it’s place in the world and that we do this, not for our own benefits, but for the benefit of those who use our maps. Please feel free to take as much as you’d like from any of the maps I create without any need at all to acknowledge me. And that goes for anyone else who may enjoy using the maps I create. if I worried about anyone using them without permission, I’d keep them on my own hard drive.